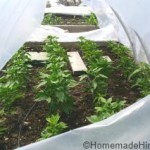 For a DIY greenhouse, the most common building materials would be wood, steel reinforcement bar (rebar) or PVC pipe, especially for a small backyard hoop house type greenhouse. Sure, there are other options for building materials like galvanized pipe or steel and aluminum framing, but most people don’t have welding materials or pipe benders, or the materials are hard to find, or the materials are too heavy to work with, or just plain cost too much (try pricing aluminum stock and c-channel, then you will see why some greenhouse kits cost $3000). 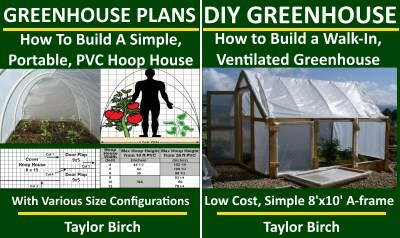 Greenhouse Building Materials – Wood, PVC or Rebar? 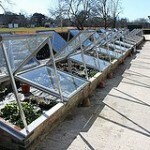 Greenhouse cost is a factor that most of us have to consider. Neither wood (lumber), rebar or PVC pipe are very expensive and prices may vary depending upon where or how much material you buy at a time. My current price for a 10 ft long, untreated 2 x 4 is a little more than $2, but a pressure-treated board is about $5. A 3/8 inch rebar (10 ft long) is about $3.50 and a 10 ft long 3/4 inch PVC pipe is about $2, so for me, treated wood is the most expensive, rebar is intermediate for expense and either untreated wood and PVC pipe are the least expensive per 10 ft unit. The weight of materials for a DIY small project, hobby greenhouse is probably not going to be a deciding factor, but comparatively, wood and rebar are relatively heavy and PVC pipe is extremely light. Lumber frame construction is the norm for most construction projects that are 3 stories tall or less and can be designed to meet most building requirements. A greenhouse frame constructed from rebar could also be very strong if the framework were welded and used lots of cross bracing. Even a framework made from PVC pipe could be fairly strong if designed with lots of cross bracing, but a simple structure made from PVC pipe would not be very strong, but it would still be suitable for small greenhouses. Wood is easy to cut and connect with nails, screws or bolts and most everyone has the necessary tools. Rectangular shaped structures are easiest to build from wood, but arches are a little more difficult. Rebar takes some effort or special saw blades to cut. Rebar could be connected by tying with wire or by welding, but most people don’t have welding equipment. Rebar is easy to bend into arched shapes, but difficult to bend short sections into 90° angles. PVC pipe is easy to cut and to connect permanently with PVC solvent. 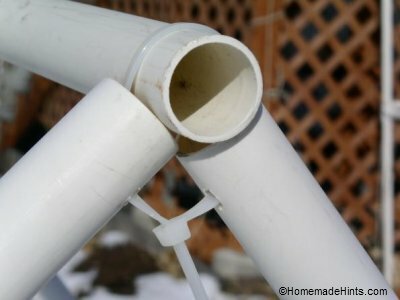 PVC pipe can be temporarily connected with bolts, screws or zip-ties. PVC is easy to bend into arched shapes and can easily form 22.5°, 45° or 90° angles with readily available elbow connectors (other angles may be hard to find). 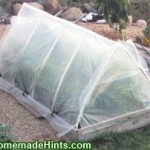 Is the Greenhouse Frame Compatible with Plastic Film Covering? Lumber would have to be smooth and checked for rough areas and splinters to prevent damage to the plastic. All nails and bolts that contact plastic sheeting would have to be flush, counter sunk or taped. Rebar could work well if all welds and cuts were ground smooth, but any rough edges and wire ties would damage the plastic sheeting. PVC is smooth and flexible and does not damage the plastic sheeting. How does Moisture Affect Wood, PVC and Rebar? Untreated wood will swell, mildew and eventually rot, especially at ground level. Treated wood should not mildew or rot, especially for a few years, but it will swell and it will leach copper into the garden (see Chemically Safe below). Also, any fasteners not made of stainless steel or heavily galvanized will rust. Rebar and the wire used to tie the rebar will rust. PVC pipe has no problems with moisture. How does the Material Hold up to Sunlight? Sunlight will not have any effect on wood or rebar. I have read quotes from people claiming that PVC pipe becomes brittle like other plastics when exposed to sunlight, but I cannot see any effect on my PVC pipes after 3 years exposed to sunlight. A study on the effect of sunlight on PVC pipe (see UNI-TR-5) exposed PVC pipe to sunlight for up to 15 years. Only the outer 0.002 inches of the pipe showed discoloration and the pipe still passed all the required tests for strength and flexibility. Untreated wood is assumed to be safe for growing vegetables. Wood treated with chromated copper arsenate (CCA) was banned by the EPA in 2003 is not safe for use in your garden. The new methods of treating wood (Alkaline Copper Quaternary (ACQ) and Copper Azole (CA) are safer, but these products still leach copper. It may be safe for humans to consume food grown in raised beds made from ACQ or CA treated wood, but leaching copper is dangerous to aquatic systems. The newest wood treatment method (Micronized Copper Quaternary (MCQ) has proven to leach 90% less copper. MCQ treated wood is a responsible choice for building raised beds or frames for vegetable gardens. Rebar will deposit small amounts of Iron into the soil (which may be good) as the rebar rusts and soil pH may be slightly decreased (Soil acidity may increase – which also might be good depending upon your soils pH and your choice of vegetables). As with other plastic products, there have been some questions raised recently about the safety of drinking water from PVC pipes manufactured prior to 1977. Since 1987, PVC pipe that is safe for drinking water has been marked with NSF-PW or NSF-61. According to NSF, certified PVC pipes do not contain Lead or Vinyl Chloride Monomer and “rigid PVC” (uPVC) pipes do not contain Phthalates or Phthalate plasticizers. We cannot find a definitive statement from NSF, EPA, CDC or others that clearly states whether or not phthalates have been detected from NSF certified PVC pipe. We are still waiting for clarification from NSF. 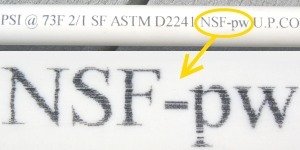 Use PVC pipes marked NSF-pw for potable water. when cutting PVC pipe (PVC cutter makes no dust, but sawing does create a fine electrostatic dust) and be careful about taking the dust into the house or around children. Also do not cut PVC pipe in the garden area so the dust is not in the soil. We should be more concerned about drinking water from a flexible garden hose than using PVC pipe as support for a greenhouse. Is the Greenhouse Easy to Dismantle and Move? This is not a usual requirement for a building material, but it was a major consideration for our greenhouse, because we wanted to be able to move the greenhouse from one raised bed to another between seasons, so the tomatoes or peppers wouldn’t be growing in the same soil every season. In order to rotate crops, we want to rotate the small greenhouse from one raised bed to the next. Rebar would be very difficult to dismantle and reassemble, and simply would not work for our purposes. A wood structure could be taken down if it were connected entirely from bolts or even screws, but it would be difficult. A permanently cemented PVC frame would be awkward to move, but on our small scale would not be too heavy to move even as one complete piece. A temporarily connected PVC frame would be easy to take down and reassemble. For our first greenhouse, we quickly settled on PVC pipe for all of the reasons listed above, but mostly because PVC pipe is inexpensive, construction is simple, so it is also simple to dismantle. move and to re-build. Next we will go over the pros and cons of greenhouse cover materials including glass, polycarbonate panels and rolls, polyethylene plastic, fiberglass, acrylic and vinyl. Question: When building your greenhouse, what materials do you think you will use? Have you used either wood, pvc or rebar in the past? Tell us about it below. I have 17/8 diameter pvc already set in hoops. I want to attach smaller diameter pvc cross beams if you will. I really need help with how to attach the two together. Any advice will be welcome. There are several ways to do this. One way is to use 3 and 4 way connectors. But these connectors may be hard to find that fit 17/8 diameter and the diameter that you use for the spine. This also requires that you cut your hoops to attach them back to the connectors. This will create a very solid structure, but it is also a large structure that is difficult to move around or to store. I came up with a method that will easily and securely fit any sizes of PVC. Since a picture is worth a thousand words, I have attached a picture from our Greenhouse eBook. I simply drilled holes in the vertical hoops, inserted zip-ties and tightened them together. At the end of the season, everything is dismantled and is easy to move and lies flat on the ground, so it takes up very little space. If you do not want to cut your hoops, you could try using zip ties to attach the spine to the hoops without cutting or drilling the hoops. I would attach the spine on the under side of the hoop so the plastic will rest against the smooth hoop. I have not had problems with the zip ties wearing holes in the plastic. Good luck with your greenhouse project and please send us a pic so we can see how you solved your problem. Greenhouse plastic film is not compatible with pvc. You need to paint (water-based) or apply felt-backed adhesive tape wherever the film and pvc meet.